A lot of our patients ask us, “what are wisdom teeth?”. Wisdom teeth are the four hindmost molars that usually appear in the adult mouth at the age of twenty. 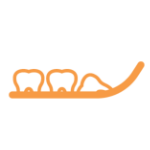 At times, a patient’s jaw can be too small for all of the teeth to fit, making the wisdom teeth emerge at an uncomfortable angle. This has the unsightly ability to push against surrounding teeth, causing immense pain and gum irritation. To remove your wisdom teeth, you may only need a local or general anaesthetic in the dentist’s chair which will be relatively quick and painless. If your wisdom teeth are in a position that causes complications, the safest option is to visit a specialist oral surgeon and have them removed in hospital. Either way, your expert at Comfy Dental will help you choose the right path for your individual procedure. Staying up to date on your dental appointments is the best way to avoid your wisdom teeth becoming impacted. If you are currently experiencing any discomfort around your hind molars, book an appointment with Comfy Dental by calling (08) 9582 8687. We can also answer any of your questions online.